If you like unusual semi-precious gemstones then you will love this. 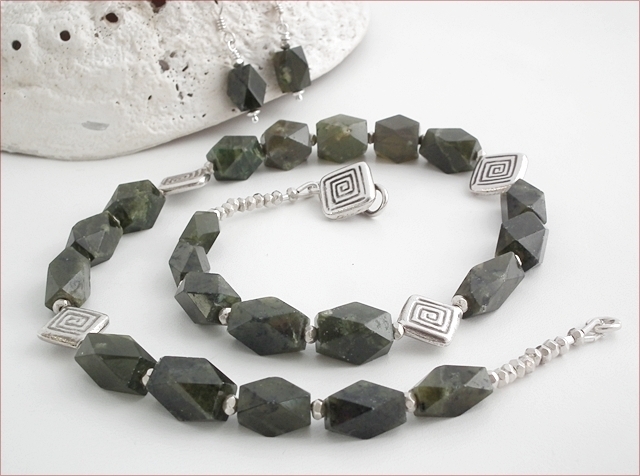 These chunky vesuvianite stones are roughly facetted in mottled shades of green with an overall dark olive colour to them. Although they look fairly opaque, there is some translucence to them when held up to the light. 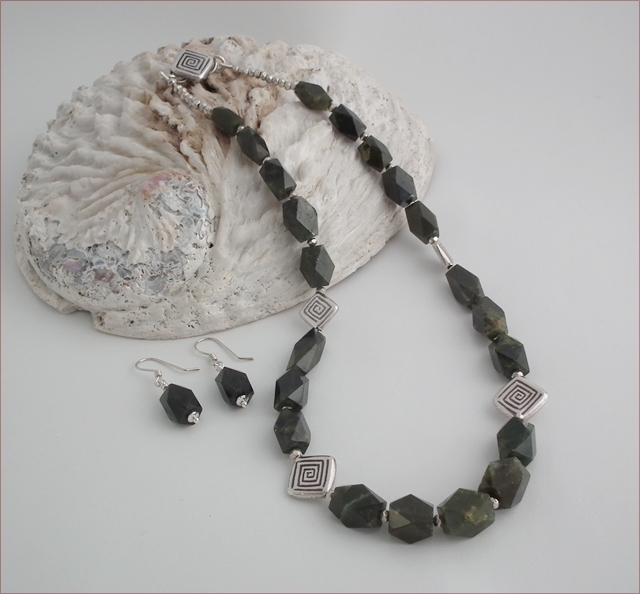 The vesuvianite is teamed with Karen Hill Tribe silver throughout, with two sizes of flat diamond beads either side of the necklace and a matching clasp, all with a geometric design on them in oxidised silver. In between are nuggets of Karen Hill Tribe silver, also roughly facetted to complement the necklace perfectly. The necklace is 19.5" (500mm) long and the matching earrings (also on Karen Hill Tribe silver) have a drop of 25mm. 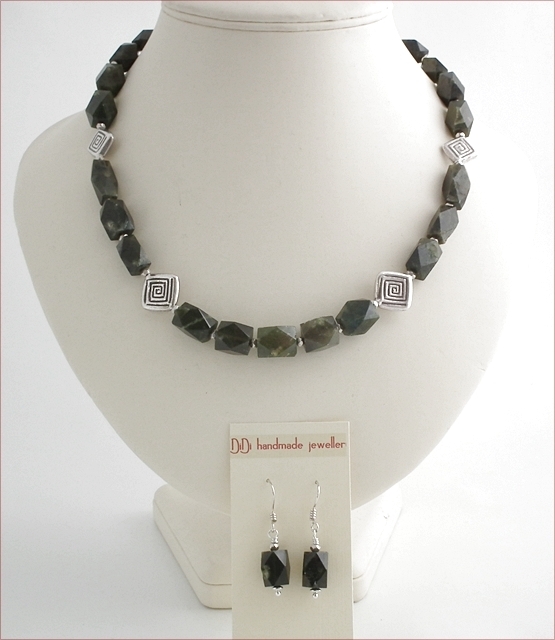 Vesuvianite is relatively rare and often found in association with Garnet, Diopside and Tourmaline. It was first discovered in 1795 near Mount Vesuvius, hence the name and is found in crystalline limestones in other places too such as California, Norway, Siberia, Switzerland and Mexico. 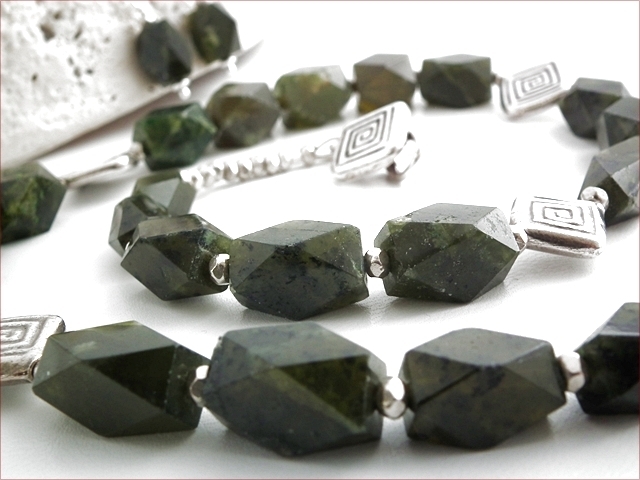 Vesuvianite is a relatively hard stone, measuring 6.5 on the Mohs Scale making it almost as hard as quartz. *Karen Hill Tribe silver is crafted by silversmiths in Thailand using silver which is much purer than sterling. Sterling has a 92.5% silver content whereas Karen silver has a minimum of 95% pure silver, often more.